I’ve always had pet allergies and my husband grew up with a Labrador Retriever. We thought we were doomed! Then we started doing our research. After our efforts to connect with people who raised Wheaten Terriers failed we moved on to Labradoodles. And as any prospective dog owner knows, looking at puppy pictures online gets you so anxious! I visited every breeder’s site in Washington, Oregon and even Northern CA, but there were few puppies available immediately and I have to admit, the ‘Doodle’ price tag was a bit daunting! I finally came across a breeder in Oregon who had 1 male left from a litter born in early June. He was adorable, smiled in all his photos. On top of that he was discounted for not having the ideal “non-shedding” coat. Needless to say we went to visit and fell in love. He even napped in my lap and peed on me! That sealed the deal. And best yet, no allergy issues. He’s a total love, incredibly smart and at just 6 months old we can’t imagine what we did without Bernie! 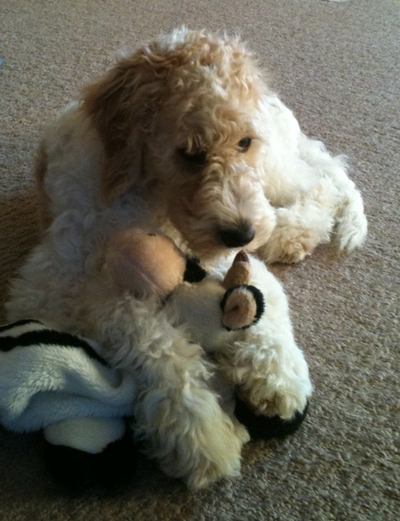 We are total Labradoodle advocates and look forward to many years of fun with him.